TL;DR I show how I determine the parts of an application that trigger unnecessary SQL statements by using graph analysis of a call tree. See second part “root cause analysis” here. We don’t need more tools that show use more problems in our software. We need ways to determine the right problem to solve. But often we just fix the symptoms on the surface rather than the underlying problems. I find that approach non-professional and want to do my part to improve this situation by delivering root cause analysis of symptoms to get to the real problems in our software. In this notebook, I’ll show you one of my approaches for mining performance problems based on application runtime performance analysis. In general, I use this approach to make the point that there are severe design errors that have a negative influence on the application’s overall performance. In this example, I show you how I determine the reasons behind a massive amount of executed SQL statements in an application step by step. The key idea is to use graph analysis to analyze call stacks that were created by a profiling tool. With this approach, I’m not only able to show the hotspots that are involved in the performance issue (that show that some SQL statements take long to execute or are executed too often), but also the reasons behind these hotspots. I achieve this by extracting various additional information like the web requests, application’s entry points and the triggers within the application causing the hotspots. This is very helpful to determine the most critical parts in the application and gives you a hint where you could start improving immediately. I use this analysis at work to determine the biggest performance bottleneck in a medium sized application (~700 kLOCs). Based on the results, we work out possible improvements for that specific hotspot, create a prototypical fix for it, measure the fix’s impact and, if the results are convincing, roll out the fix for that problem application wide (and work on the next performance bottleneck and so on). I hope you’ll see that this is a very reasonable approach albeit the simplified use case that I show in this blog post/notebook. The first ones are dependent on the environment and programming language you use. jQAssistant, Neo4j and Pandas are my default environment for software analytics so far. I’ll show you how all those tools fit together. *actually, what you see here, is the result of an executed Jupyter notebook, too. You can find that notebook on GitHub. As a prerequisite for this analysis, we need performance profiling data gathered by a profiler. A profiler will be integrated into the runtime environment (e. g. Java Virtual Machine) of your application and measures diverse properties like method execution time, number of web service calls, executed SQL statements etc. Additionally, we need something that uses or clicks through our application to get some numbers. In my case, I run the Spring PetClinic performance test using JMeter. As profiling tool, I use JProfiler to record some performance measures while the test was running. JProfiler is a great commercial tool for profiling Java application and costs around 400 €. It really worth the money because it gives you deep insights how your application performs under the hood. Also outside the advertisement block, I personally like JProfiler a lot because it does what it does very very good. Back to the article. The recording of the measures starts before the execution of the performance test and stops after the test has finished successfully. The result is stored in a file as so-called “snapshot” (the use of a snapshot enables you to repeat your analysis over and over again with exactly the same performance measures). This is the data that we need for our SQL statement analysis. The big problem is, that we can’t easily see where all those SQL statements come from because we just see the isolated SQL statements. This file consists of all the information that we’ve seen in the JProfiler GUI, but as XML elements and attributes. And here comes the great part: The content itself is graph-like because the XML elements are nested! So the <tree> element contains the <hotspot> elements that contain the <node> elements and so on. A case for a graph database like Neo4j! But how do we get that XML file into our Neo4j database? jQAssistant to the rescue! 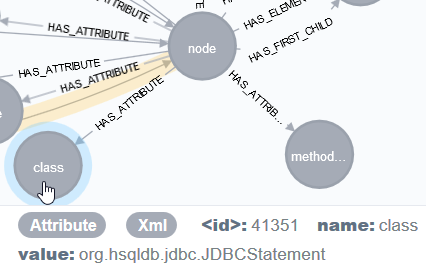 This will import the XML structure as a graph into the Neo4j graph database that is used by jQAssistant under the hood. The pink node is the entry point – the XML file. To the right, there is the first XML element <tree> in that file, connected by the HAS_ROOT_ELEMENT relationship. 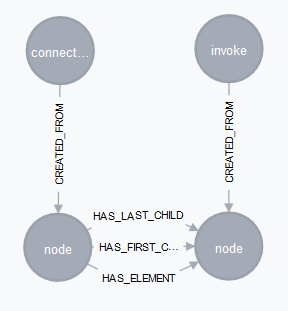 The <tree> element has some attributes, connected by HAS_ATTRIBUTE. From the <tree> element, there are multiple outgoing relationships with various <hotspot> nodes, containing some information about the executed SQLs in the referenced attributes. The attributes that are connected to these elements contain the values that we need for our purpose later on. Each element or attribute is also labeled correspondingly with Element or Attribute. We execute a simple query for one XML element and it’s relationships to its attributes. value="SELECT id, name FROM types ORDER BY name"
as graph, we get that information from all the attributes of an element (don’t worry about the syntax of the following two Cypher statements. They are just there to show you the underlying data as an example). 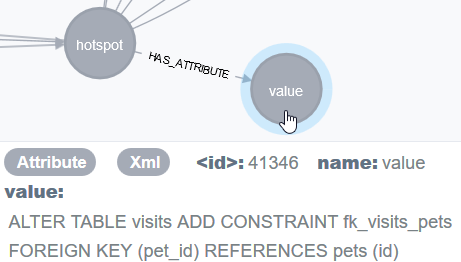 WHERE a.value = "SELECT id, name FROM types ORDER BY name"
As seen in the picture with the huge graph above, each <hotspot> node refers to the further <node>s, that call the hotspots. In our case, these nodes are the methods in our application that are responsible for the executions of the SQL statements. Because it’s a bit cumbersome to work at the abstraction level of the XML file, let’s enrich this graph with a few better concepts for mining performance problems. Before executing the first statements, we clean up any preexisting data from previous queries. This is only necessary when you execute this notebook several times on the same data store (like me). It makes the results repeatable and thus more reproducible (a property we should generally strive for!). We create some new nodes that contain all the information from the XML part of the graph that we need. We simply copy the values of some attributes to new Call nodes. This information can be used to connect the Call nodes as well as the HotSpot nodes. And there we have it! 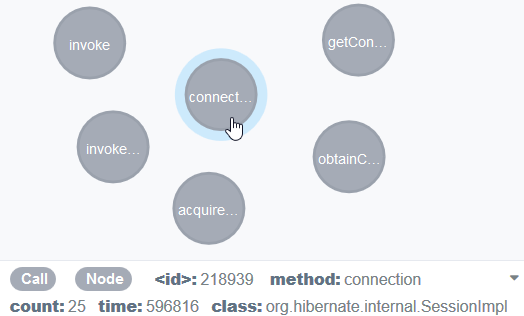 Just click in the Neo4j browser on the relationship CALLS and the you’ll see our call tree from JProfiler as call graph in Neo4j, ready for root cause analysis! That should be enough for today. 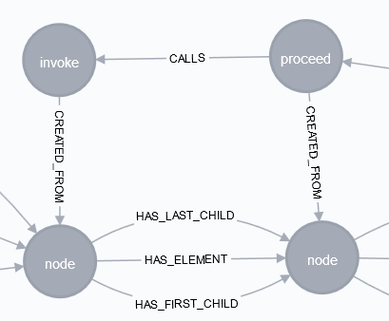 So stay tuned for the existing analysis part in the next blog post where we play around with our call graph!